This is another pre-order, this time of ROM. This is the third time I've drawn ROM and I was really happy with how it turned out. Thanks Steve! I was thinking of him just the other day. Awesome work as always and I think the craziest thing is this is the third time you've drawn him? Dire Wraiths beware! You've taken a character that I've always had a hard time "getting" visually and portrayed him in a way that makes him look both formidable and appropriately sci-fi pulpy. 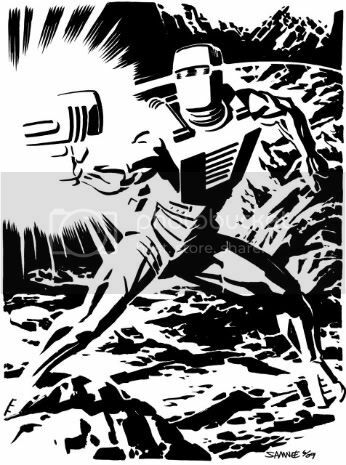 I dig the spinning quick-draw appearance of ROM in this piece. Great posing and presentation.